This independent, freestanding hot water hand washing washroom is easy to accommodate within its 4 foot square footprint. It sits slightly higher that its toilet cousin, due to the integral waste tank situated beneath the floor area. Our hot water hand washing station is electrically powered, via a mains connection or generator. This is fully protected by a residual circuit device or MCB. This provides a ‘hands-free’ operation to an ‘on – demand’ 20 second flow of hot water, via a clever ‘state of the art’ infra red switch. We provide a supply of paper towels in a wall mounted dispenser as well as hand soap. A PIR sensor is connected to an internal light should the going get dark, although the semi clear roof does allow ambient light to filter in. Adjacent to the sink is a built in shelf where items can be placed while washing. The lockable door also has a small mirror, so you can check your hair on the way out! The unit can be operated in one of two ways. Either by using a mains water supply connected to the rear of the cubicle, with waste then entering the lower tank. This can be emptied either by pump to the internal waste tank connecting point, concealed by a screw cap, or waste water can be allowed to flow out on a gravity basis via another external exit plug. Alternatively an on board fresh water tank can supply your requirements, offering greater flexibility for positioning the unit away from services. Internally the handwash station features an integral, full forearm sink bowl. The benefits of having a separate washing unit, are principally good hygiene. Wash basins in portable toilets are often unsatisfactory for full decontamination. There is generally inadequate room for a full size sink and the time taken to wash hands properly renders the toilet unavailable for its primary purpose. HSE and the purple guide for events can be downloaded here. 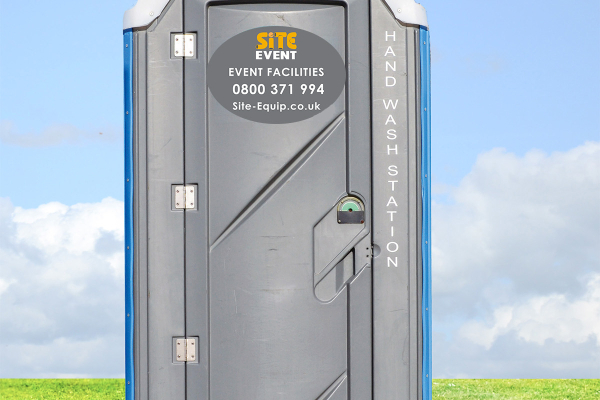 We can deliver this hand washing station along with your toilet hire, across the South of England.